The ability to measure the blood lactate level in a non-invasive, non-contact manner is very appealing to the sports industry as well as the home care field. That is mainly because this substance level is an imperative parameter in the course of devolving a personal workout programs. Moreover, the blood lactate level is also a pivotal means in estimation of muscles' performance capability. In this manuscript we propose an optical non-contact approach to estimate the concentration level of this parameter. Firstly, we introduce the connection between the physiological muscle tremor and the lactate blood levels. Secondly, we suggest a photonic optical method to estimate the physiological tremor. Lastly, we present the results of tests conducted to establish proof of concept to this connection. F. Tenner, Z. Zalevsky, and M. Schmidt, “Optical tremor analysis with speckle imaging technique,” J. Imaging Sci. Technol. 59(1), 10402 (2015). Z. Zalevsky, Y. Beiderman, I. Margalit, S. Gingold, M. Teicher, V. Mico, and J. Garcia, “Simultaneous remote extraction of multiple speech sources and heart beats from secondary speckles pattern,” Opt. Express 17(24), 21566–21580 (2009). Y. Beiderman, I. Horovitz, N. Burshtein, M. Teicher, J. Garcia, V. Mico, and Z. Zalevsky, “Remote estimation of blood pulse pressure via temporal tracking of reflected secondary speckles pattern,” J. Biomed. Opt. 15(6), 061707 (2010), doi:. I. Margalit, Y. Beiderman, A. Skaat, E. Rosenfeld, M. Belkin, R.-P. Tornow, V. Mico, J. Garcia, and Z. Zalevsky, “New method for remote and repeatable monitoring of intraocular pressure variations,” J. Biomed. Opt. 19(2), 027002 (2014). N. Ozana, N. Arbel, Y. Beiderman, V. Mico, M. Sanz, J. Garcia, and Z. Zalevsky, “Improved noncontact optical sensor for detection of glucose concentration and indication of dehydration level,” Biomed. Opt. Express 5, 1926–1940 (2014). 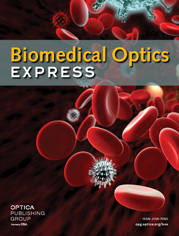 A. Shenhav, Z. Brodie, Y. Beiderman, J. Garcia, V. Mico, and Z. Zalevsky, “Optical sensor for remote estimation of alcohol concentration in blood stream,” Opt. Commun. 289, 149–157 (2013). J. Marshall and E. G. Walsh, “Physiological tremor,” J. Neurol. Neurosurg. Psychiatry 19(4), 260–267 (1956). J. H. McAuley and C. D. Marsden, “Physiological and pathological tremors and rhythmic central motor control,” Brain 123, 1545–1567 (2000). J. Puleo and P. Milroy, Running Anatomy (Human Kinetics, 2010) pp. 30–34. M. Hargreaves and L. Spriet, Exercise Metabolism, 2nd ed. (Human Kinetics, 2006) pp. 7–26. S. Kulandaivelan, “Test retest reproducibility of a hand-held lactate analyzer in healthy men,” J. Exercise Sci. Physio. 5(1), 30–33 (2009). T. Miller, NSCA's Guide to Tests and Assessments (Human Kinetics, 2012) pp. 130–135. M. Coulson and D. Archer, Practical Fitness Testing: Analysis in Exercise and Sport (2009) p. 211–214. Fig. 1 Illustration of the experimental setup. Fig. 2 The ESD measurement of the signal acquired by our system, without a subject. Fig. 3 ESD of the signal measured from the leg in 4 running intervals. The reference lactate level measured here was 9 [mmol/l] and displayed in the red continuous line. Fig. 4 Normalized value of lactate level (black line) and normalized value of maximal energetic spectral density (red line) in the relevant frequency range vs. the running interval number. Fig. 5 A test performed on the “quadriceps femoris” muscle in a 26 year old athletic female using the same protocol as mentioned above. The dotted line is the reference measurement where the lactate level was 1.2 [mmol/l]. (a) The signal spectrum measured after the first running interval. (b) The signal spectrum measured after the second running interval. (c) The signal spectrum measured after the third running interval. (d) The signal spectrum measured after the fourth running. (e) The signal spectrum measured after the fifth running interval. Fig. 6 The normalized lactate level and maximal energetic spectral density of the 27 year old thigh muscle as function of the running interval. Table 2 Three test protocols results performed on the same subject. Three test protocols results performed on the same subject.